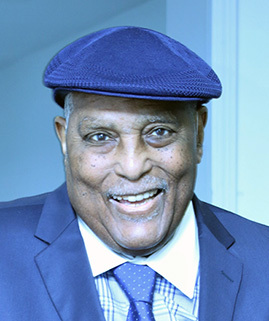 Willie L. “Bubba” Charles, Sr., 75, of New Haven, formerly of Clinton, CT, entered eternal rest on May 2, 2018. He was the widower of Rita L. Charles. Mr. Charles was born in Society Hill, SC on February 18, 1943, a son of the late James Charles, Sr. and Hattie McKay Charles. Prior to retiring, Willie was employed as a Police Officer for Yale University for over 34 years. He was the owner of Charles Catering Services with his wife Rita; employed as Cook and House Manager at St. Elmo’s Honor Society of Yale for 41 years; and was a Barber at Herman and Therman Barbershop for 20 years. He leaves to cherish loving memories, daughters, Letitia and Mhiku Charles; a son, Willie L. Charles, Jr.; sisters, Janie Charles Holmes and Carolyn Charles Carrington; grandchildren, Rita, Koree, Kobe, Kourtney and Sage Charles and Sacha Escobar; great grandchildren, Azariah and Azir Charles; sisters in-law, Tracy Tanner (James), Melody Jack, Amber Anderson (Herbert) and Johnnie Stanley (Harry Sr.); a brother in-law, John Arnold, Jr. (Renee); and a host of other relatives and friends. A celebration of Mr. Charles’ life and legacy will be held Friday, May 11, 2018, at 11:00 a.m. at Beulah Heights First Pentecostal Church, 782 Orchard St., New Haven. Viewing and visitation will be held at the church from 10:00-11:00 a.m. Burial will be in Evergreen Cemetery. Thank you so much. Yes we do go way, way back and we must commit to doing a better job of staying in touch. It’s time like this that make us aware of the need to stay in touch. May God bless each member of the Charles Family. Janie and Carolyn, may you be comforted by memories of laughter, love, and joy in the days to come. I pray God’s gentle peace will enfold you at this time and always. What a nice legacy; Rejoice and again I say Rejoice! Thank you so much Peaches. Dear Carolyn & Janie, I’m sadden to hear of the loss of your brother Bubba. Please accept my heartfelt condolences to you and your family. Please know that my love and prayers are with you at this time. Hold on to the good times you’ve shared together. My wife Natalie and I worked with Willie for over 30 yrs. He was a fair compassionate hardworking man. My condolences to your loved ones. I’m in Florida and won’t be able to attend the services. Go Willie and receive your eternal reward. You’ll be missed my friend. Rest In Peace! Thank you for your thoughts and prayers Skip and Natalie. To the Family of Willie Charles, I would like to express my sincere condolences to all of you, on my behalf and on behalf of the Clinton Rotary Club of which he was an honored member for many years. I met him about 30 years ago and had the pleasure of working by his side at many Bluefish Festivals, where he taught me his secret fish recipes, showed me his secret seasoning recipe and groomed me to take over when he no longer had time to do it. In later years, my wife and I purchased the land where he and Rita had there house in Clinton and it was lost to fire. I never met a harder working, family oriented, more caring man than Bubba. He had a caring way about him and was well respected by anyone who knew him. He will be missed by all who knew him. I truly enjoyed the time spent with him, especially in Rotary. May god Bless him and now he is with the Love of his life, Rita. God Bless you all! Rest in peace Mr Charles till we meet again. You will be surely missed..
With my condolences and hope that the pain of his passing will fade quickly, leaving the memories of a man of the type you don’t encounter very often…. This reply comes at a much later time than what I would have wanted it to. I want to Thank you for the beautiful words that I feel really reflect my Dad and who he was. You brought a smile to all of us with your words of comfort. Carol Janie and family our hearts are with you during these most difficult times. Bubba whom I affectionately call was my barber since the age of fifteen. He was also the provider of my sons first haircut. He was a friend and confidant of whom I had the utmost respect. He will be missed by me and many others. With much love, Marshall & Sharon Gambrell. This reply comes much later than I intended it to. We want to Thank you for your wonderful words. My Dad had a continuous Love for all the kids at St. Elmo’s and enjoyed how he was always part of this special family. Thank you again and my apologies for such a late reply. Our sincere sympathies to the family for the loss of your Loved one! May Jehovah God grant you Peace and give you much Comfort. Carol and Janie our hearts and prayers are with you during these most difficult times, Bubba who I affectionately refer to has been my barber the age of fifteen, He also provided my son with his first haircut. He has been a friend and confidant to me over the years and I have nothing but the utmost respect for him, May he rest in peace, with all our love Marshall & Sharon Gambrell.